As grueling as it is to actually sit down and view the work in the form of a motion picture-- at the very least, co-director Marc F. Adler and Jason Maurer’s feature filmmaking debut Delgo can be considered a bold experiment. And as such, it’s one that’s worth exploring purely for those interested in the business side of independent filmmaking... even if the finished product is visually unappealing, filled with far too many characters, and seems to crib extensively from far superior tales by Peter Jackson, George Lucas, Steven Spielberg, and Ang Lee. While admittedly the lack of a good studio push or ad campaign most likely hindered it beyond repair, Adler and Maurer knew going into the venture that spreading word-of-mouth for their labor-of-love would be an uphill climb. To combat this, the guys took a proactive route and made an unprecedented decision to let audiences around the world in on the entire filmmaking experience. 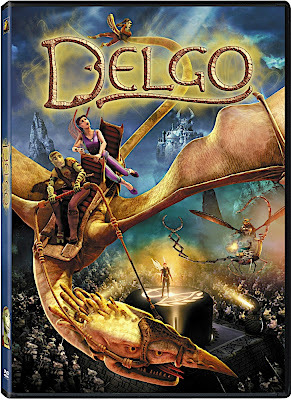 By posting the movie’s dailies on Delgo’s official website, it enabled the directors to utilize the free advertising of the internet by sharing “rough footage, fragments of animation as they were being scrutinized, polished, and reworked." 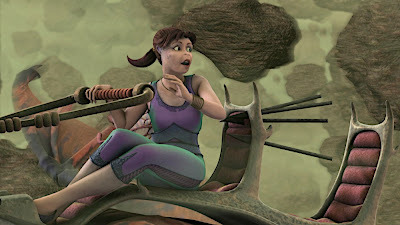 This action “was a first for any active studio production," yet the movie being served up by the filmmakers in collaboration with their animation team at Fathom Studios independently made another creative marketing decision along the way. 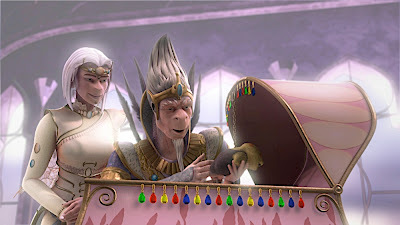 To this end, they used their budget wisely to secure an amazing roster of talent to voice the film and then spread out the casting announcements to help build up anticipation for Delgo. Yet perhaps because the entire production lasted more than five years—going well beyond Kubrick Eyes Wide Shut territory— eventually I’m assuming the novelty of watching a live film being made wore off. And this may have overwhelmingly been the case when the lead voice actors--Freddie Prinze Jr. and Jennifer Love Hewitt-- were no longer quite as in-demand as they had been many years earlier or when viewers discovered how poorly conceived the plot-line was at its very core. Essentially, we’re presented with a star-crossed lover story straight out of Romeo and Juliet or West Side Story via this wrong-side-of-the-magical-world Jhamora scenario as our main character Delgo (Prinze Jr.) becomes friends with an independent princess Kyla (Hewitt). 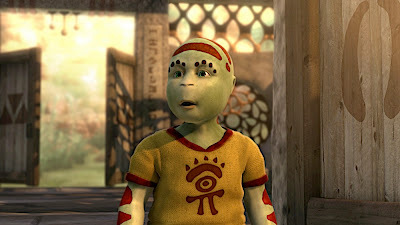 Furthermore, each character comes from two feuding civilizations which is visually apparent right away as Delgo originates from the Lockni natives in what appears to have been a misguided animation attempt wherein, instead of Shrek, he resembles a gecko crossed with a dinosaur crossed with a person. 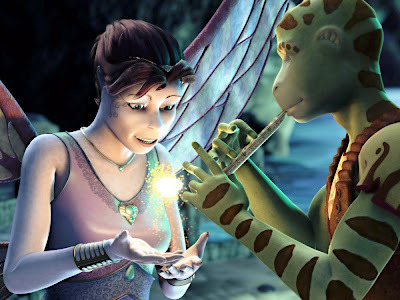 Fortunately for Hewitt's character, Princess Kyla was hit with the adorable pixie fairy-like stick as a member of Nohrin royalty who seems to be hoping for a role as Tinkerbell's understudy if she ever went "punk." When you add in a backstory involving murder and then frame the current relationship of the two teens amidst a series of misunderstandings, the plot becomes increasingly convoluted until predictably it ends with the important message about the need for tolerance and peace. Utilizing nearly the same number of writers as it took years to complete the work which is sadly the final film of Hollywood legend and actress Anne Bancroft, ultimately Delgo never effectively engages us on any level with unappealing animation completed entirely on computers that still comes across murky and dull on the DVD in addition to its cliché heavy, forgettable plot. While it was a brilliant attempt and great strategy to use their finances to secure not just the aforementioned actors but also Val Kilmer, Malcolm McDowell, Louis Gossett Jr., Burt Reynolds, Eric Idle, Chris Kattan and Kelly Ripa, when you discover that the impressive Michael Clarke Duncan ended up recording his vocal work 3,000 miles away from where the production was taking place, then it’s no wonder that most of those involved sound only halfheartedly caught up in the feature. Again, I do admire and applaud what normally would’ve been an ingenious publicity and marketing strategy had they started with the most important building block of a solid script, made the animation easier on the eyes and completed the work in a year or two. Unfortunately the only intriguing insight I can offer you about Delgo is that halfway through the film I was so bored that I realized if you turned the letters around it spells “Ogled” and sadly, this isn’t one film you won’t want to have ogled.